Trip hammer in Dalarna, Sweden. fabricating various articles of wrought iron, latten (an early form of brass), steel and other metals. One or more trip hammers were set up in a forge, also known variously as a hammer mill, hammer forge or hammer works. The hammers were usually raised by a cam and then released to fall under the force of gravity. Historically, trip hammers were often powered by a water wheel, and are known to have been used in China as long ago as 40 BC or maybe even as far back as the Zhou Dynasty (1050 BC–221 BC) and in medieval Europe by the 12th century. During the Industrial Revolution the trip hammer fell out of favor and was replaced with the power hammer. Often multiple hammers were powered via a set of line shafts, pulleys and belts from a centrally located power supply. With his description, it is seen that the out-of-date Chinese term for pestle and mortar (dui, tui) would soon be replaced with the Chinese term for the water-powered trip-hammer (Chinese: 水碓 Pinyin: shui dui; Wade–Giles: shui tui). The Han Dynasty scholar and poet Ma Rong (79–166 AD) mentioned in one of his poems of hammers 'pounding in the water-echoing caves'. As described in the Hou Han Shu, in 129 AD the official Yu Xu gave a report to Emperor Shun of Han that trip hammers were being exported from Han China to the Western Qiang people by way of canals through the Qilian Mountains. In his Rou Xing Lun, the government official Kong Rong (153–208 AD) remarked that the invention of the trip hammer was an excellent example of a product created by intelligent men during his own age (comparing the relative achievements of the sages of old). 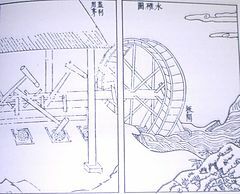 During the 3rd century AD, the high government official and engineer Du Yu established the use of combined trip hammer batteries (lian zhi dui), which employed several shafts that were arranged to work off one large waterwheel. In Chinese texts of the 4th century, there are written accounts of men possessing and operating hundreds of trip hammer machines, such as the venerable mathematician Wang Rong (died 306 AD), Deng Yu (died 326 AD), and Shi Chong (died 300 AD), responsible for the operation of hundreds of trip hammers in over thirty governmental districts throughout China. There are numerous references to trip hammers during the Tang Dynasty (618–907 AD) and Song Dynasty (960–1279), and there are Ming Dynasty (1368–1644) references that report the use of trip hammers in papermills of Fujian Province. Although Chinese trip hammers in China were sometimes powered by the more efficient vertical-set waterwheel, the Chinese often employed the horizontal-set waterwheel in operating trip hammers, along with recumbent hammers. The recumbent hammer was found in Chinese illustrations by 1313 AD, with the publishing of Wang Zhen's Nong Shu book on ancient and contemporary (medieval) metallurgy in China. There were also illustrations of trip hammers in an encyclopedia of 1637, written by Song Yingxing (1587–1666). An obscure and perhaps corrupt passage in the Natural History of the Roman scholar Pliny (NH 18.23) was taken by some historians to indicate that water-driven pestles had become widespread in Italy by the 1st century AD. Although the majority of Roman water-powered sites that have been identified were for grain milling, there is a possibility that water power was used to drive an ore-crushing hammer at the Roman gold mine at Dolaucothi by the end of the first century AD. Here, the regularity and spacing of large indentations on the Pumsaint stone indicate the use of a water-powered trip hammer. Such abraded stones have been found at the Iberian peninsula in Spain and Portugal, where the datable examples are from the 1st and 2nd century AD. As yet, however, none of the examples from Spain or Portugal can be convincingly associated with a mill site, though most mines certainly had convenient water sources and associated leat systems, the power of which could have been harnessed. In Ickham in Kent, a 4th century large metal hammer-head with mechanical deformations was excavated in an area where several Roman water-mills and metal waste dumps have also been traced, indicating Roman use of water-powered trip hammers for metal working. Grain-pounders with pestles, as well as ordinary watermills, are also attested as late as the middle of the 5th century in a monastery founded by Romanus of Condat in the remote Jura region, indicating that the knowledge of trip hammers continued into the early Middle Ages. Water-powered and mechanised trip hammers reappeared in medieval Europe by the 12th century. Their use was described in medieval written sources of Styria (in modern-day Austria), written in 1135 and another in 1175 AD. Medieval French sources of the years 1116 and 1249 both record the use of mechanised trip hammers used in the forging of wrought iron. Medieval European trip hammers by the 15th century were most often in the shape of the vertical pestle stamp-mill, although they employed more frequent use of the vertical waterwheel than earlier Chinese versions (which often used the horizontal waterwheel). The well-known Renaissance artist and inventor Leonardo da Vinci often sketched trip hammers for use in forges and even file-cutting machinery, those of the vertical pestle stamp-mill type. The oldest depicted European illustration of a martinet forge-hammer is perhaps the Historia de Gentibus Septentrionalibus of Olaus Magnus, dated to 1565 AD. In this woodcut image, there is the scene of three martinets and a waterwheel working wood and leather bellows of the Osmund Bloomery furnace. The recumbrent hammer was first depicted in European artwork in an illustration by Sandrart and Zonca (dated 1621 AD). A trip hammer has the head mounted at the end of a recumbent helve, hence the alternative name of helve hammer. The choice of which type was used in a particular context may have depended on the strain that its operation imposed on the helve. This was normally of wood, mounted in a cast iron ring (called the hurst) where it pivoted. However, in the 19th century the heaviest helves were sometimes a single casting, incorporating the hurst. The tilt hammer or tail helve hammer has a pivot at the centre of the helve on which it is mounted, and is lifted by pushing the opposite end to the head downwards. In practice, the head on such hammers seems to have been limited to one hundredweight (about 50 kg), but a very rapid stroke rate was possible. This made it suitable for drawing iron down to small sizes suitable for the cutlery trades. There were therefore many such forges known as 'tilts' around Sheffield. They were also used in brass battery works for making brass (or copper) pots and pans. In battery works (at least) it was possible for one power source to operate several hammers. In Germany, tilt hammers of up to 300 kg were used in hammer mills to forge iron. 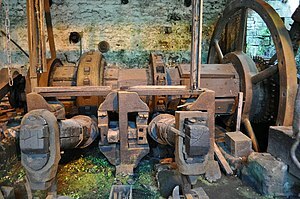 Surviving, working hammers, powered by water wheels, may be seen, for example, at the Frohnauer Hammer in the Ore Mountains. The belly helve hammer was the kind normally found in a finery forge, used for making pig iron into forgeable bar iron. This was lifted by cams striking the helve between the pivot and the head. The head usually weighed quarter of a ton. This was probably the case because the strain on a wooden helve would have been too great if the head were heavier. The nose helve hammer seems to have been unusual until the late 18th or early 19th century. This was lifted beyond the head. Surviving nose helves and those in pictures appear to be of cast iron. The steam-powered drop hammer replaced the trip hammer (at least for the largest forgings). James Nasmyth invented it in 1839 and patented in 1842. However, by then forging had become less important for the iron industry, following the improvements to the rolling mill that went along with the adoption of puddling from the end of the 18th century. Nevertheless, hammers continued to be needed for shingling. ^ a b Needham, Volume 4, Part 2, 184. ^ Needham, Volume 4, Part 2, 183. ^ a b Needham, Volume 4, Part 2, 390. ^ a b c d Needham, Volume 4, Part 2, 392. ^ Needham, Volume 4, Part 2, 393. ^ Needham, Volume 4, Part 2, 392-393. ^ a b Needham, Volume 4, Part 2, 394. ^ Needham, Volume 4, Part 2, 391-392. ^ a b c d e Needham, Volume 4, Part 2, 395. ^ a b Needham, Volume 4, Part 2, 379. Needham, Joseph; Wang, Ling. (1986) . Science and Civilization in China: Volume 4, Physics and Physical Technology, Part 2, Mechanical Engineering. Taipei: Caves Books Ltd (reprint edition of Cambridge & New York: Cambridge University Press). ISBN 0-521-05803-1. Song, Yingxing, translated with preface by E-Tu Zen Sun and Shiou-Chuan Sun: T'ien-Kung K'ai-Wu: Chinese Technology in the Seventeenth Century. (University Park: Pennsylvania State University Press 1966). Wikimedia Commons has media related to Trip hammers. "Diagram of a forge trip hammer". ExplorePAHistory.com. WITF; Pennsylvania Historical and Museum Commission. Retrieved 22 January 2013.